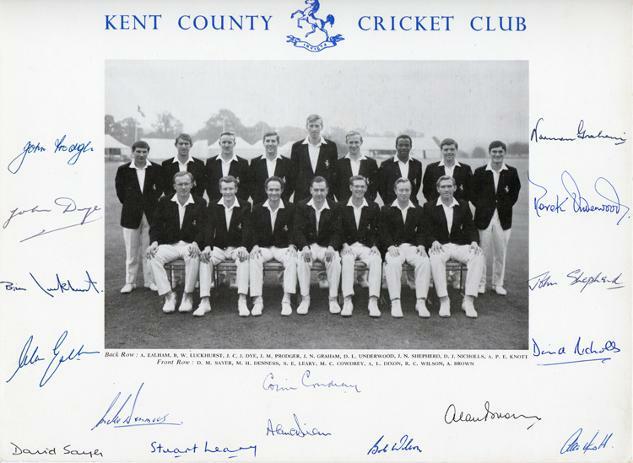 Signed 1970s Kent Cricket portrait photo. 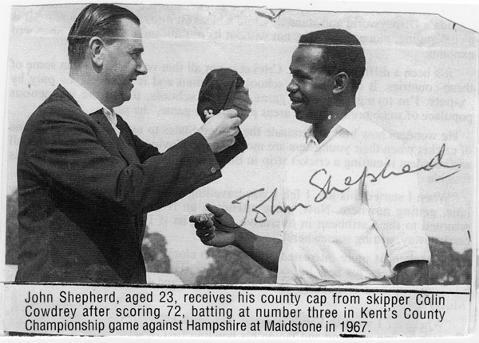 Depicting a 23-year-old Shep receiving his county cap (in 1967) at Mote Park, Maidstone, from Kent CCC captain Colin Cowdrey. Presented to John Shepherd for his personal collection. 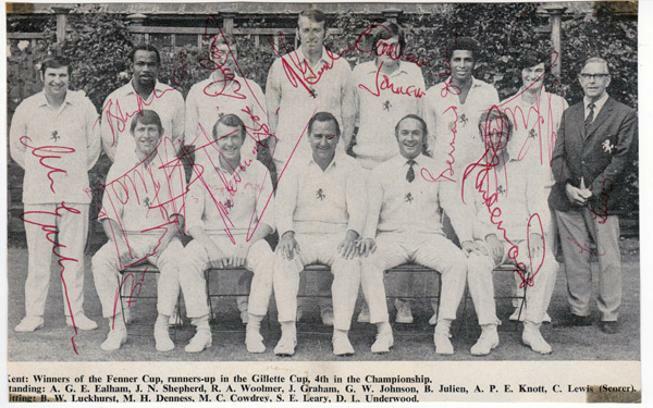 Signed B&W Kent CCC book page. 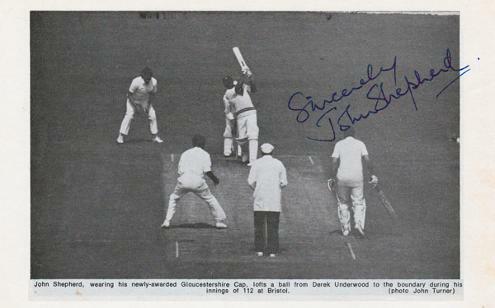 Shows John hitting Derek Underwood for four on his way to a hundred for Gloucester CCC against his old county at Bristol in 1983. Signed at the Darren Stevens Benefit lunch launch in Feb 2016. 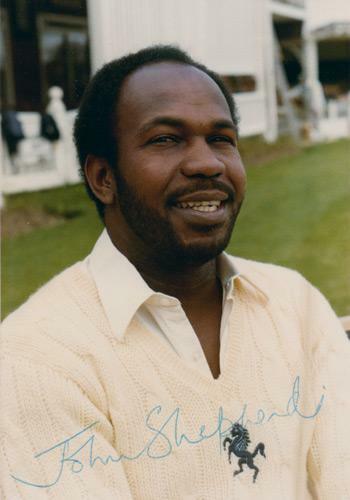 Shep explained that he reached his 100 via an inside edge off Derek Underwood, and Deadly still reminds him of his luck every time he sees him. Presented to John for his personal collection. 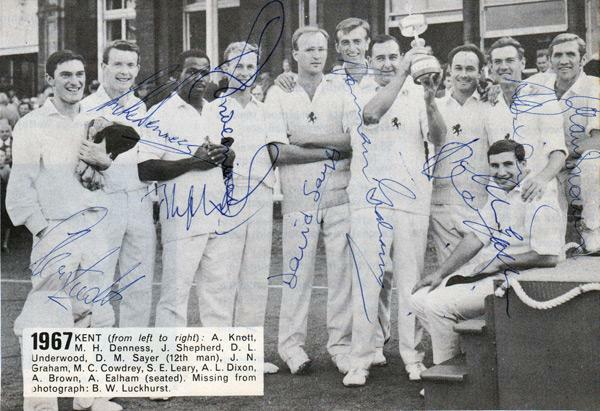 Official team photo signed by 16 players: Colin Cowdrey, Derek Underwood, Alan Knott, John Shepherd, Alan Ealham, Mike Denness, Brian Luckhurst, John Dye, Norman Graham, Stuart Leary, David Nicholls, Alan Brown, Alan Dixon, David Sayer, John Prodger and Bob Wilson. of the Friends Provident limited overs champions. Alan Knott, Mike Denness, John Shepherd, Derek Underwood, David Sayer, Norman Graham, Alan Ealham, Alan Dixon & Alan Brown. 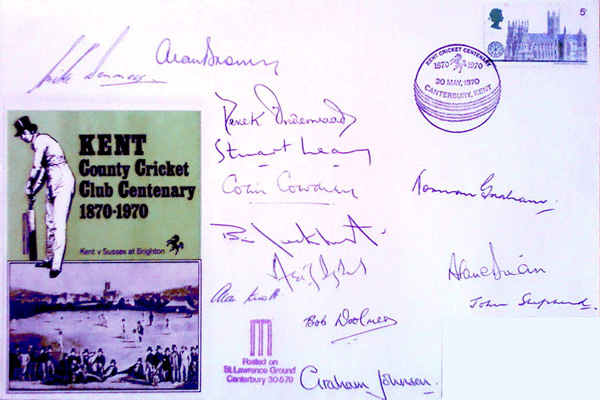 KCCC FDC signed by 13 Kent Cricket players inc: Mike Denness, Alan Brown, Derek Underwood, Stuart Leary, Colin Cowdrey, Brian Luckhurst, Asif Iqbal, Alan Knott, Bob Woolmer, Graham Johnson, Norman Graham, Alan Dixon & John Shepherd. Alan Knott (twice), Brian Luckhurst, Mike Denness & Derek Underwood.